PokerStars is one of the best online poker rooms and can easily have one of the best lineup of poker professionals that represent the site. The top professionals that currently are endorsing the poker giant are Daniel Negreanu, Barry Greenstein, Joe Hachem, Greg Raymer and many more. PokerStars also has an international crew of celebrity endorsers which include NHL star Mats Sundin, former tennis professional Boris Becker and former MLB star Orel Hershiser. Well you can now add actor and poker fanatic Jason Alexander to the list of celebrity endorsers. Jason Alexander is no push over when it comes to poker because he actually has been around playing in some of the most popular tournaments for the past couple of years. He has made an appearance on NBC’s Heads Up Championship and has made several appearances in the World Series of Poker. 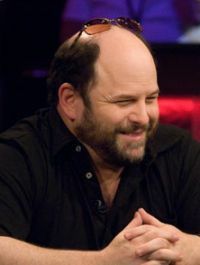 Another poker game that saw a lot of Jason Alexander was the popular show Celebrity Poker Showdown. If you would like to take on Jason Alexander on PokerStars you can find him playing under the name J. Alexander but before you do visit our PokerStars online poker room review.